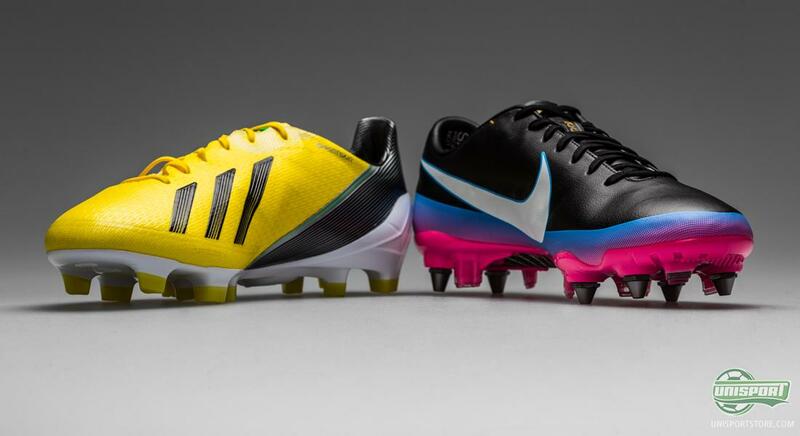 Just one single day separated the launch of the new Adidas and the Nike speed boots, respectively. 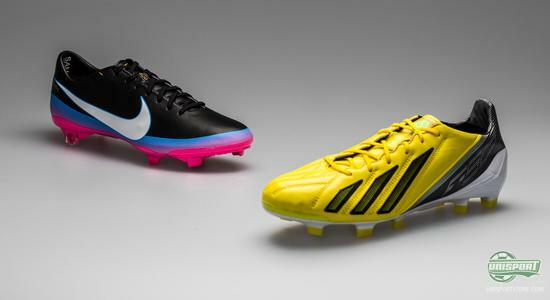 Nike launched the Nike Mercurial Vapor VIII ACC CR7, which is exclusive to Cristiano Ronaldo; and Adidas presented the fourth generation of their Adidas F50 Adizero, with Lionel Messi as it's front man. But how will they perform in a head-to-head comparison? 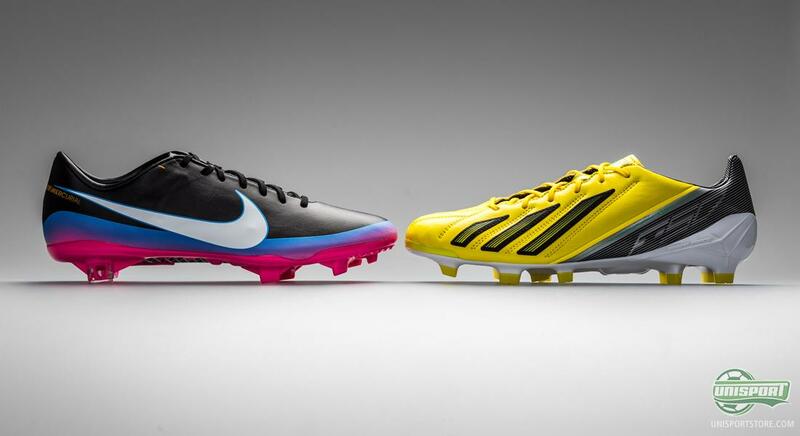 The rivalry is obvious, both between Cristiano Ronaldo and Lionel Messi, as well as, Nike and Adidas. They fight a constant battle and today we will look at the latest offspring from both brands' speed collections. 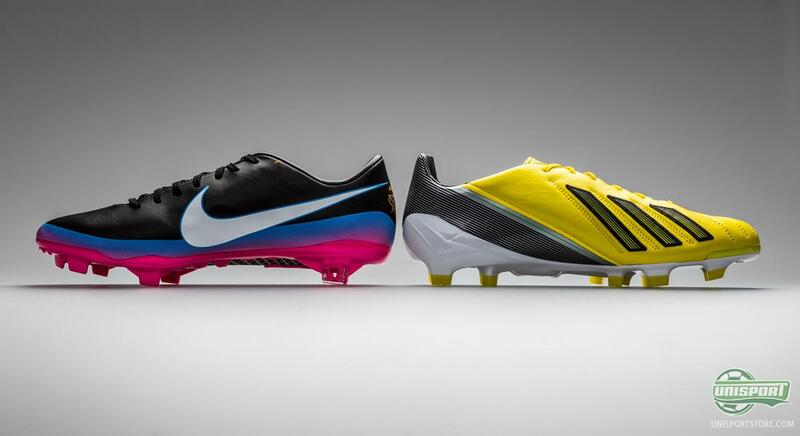 We are, of course, talking about the new fourth generation of the Adidas F50 Adizero, which Lionel Messi will début tonight and the Nike Mercurial Vapor VIII ACC CR7 that Cristiano Ronaldo début yesterday. On the Adidas F50 Adizero, Adidas have, once again, gone with the super nice AdiLite microfibre upper, which is built from one single layer. This provides a fantastic touch on the ball, almost similar to playing bare-foot. In addition, they also provide an alternative to the microfibre Adidas F50 Adizero, which is a leather version, preferred by Messi, among others. Hereby, you have the option of choosing between a sharp tight touch, provided by the microfibre upper, or the natural soft and very comfortable touch from the leather version. Moving on to the Nike Mercurial Vapor VIII ACC CR7, the upper is, once again, provided by the Japanese microfibre specialists from Teijin. On this latest model, the upper has been provided with a coating that emulates leather and the result is an incredibly soft, supple and pleasant upper material, that can easily be mistaken for real leather. 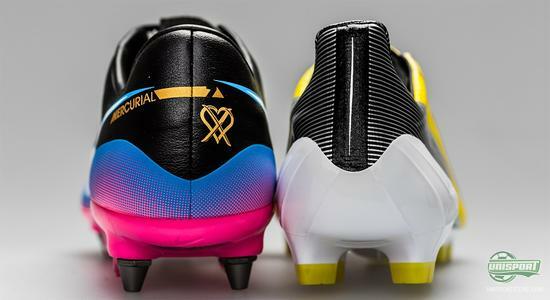 In order to prepare Ronaldo, and the rest of the Vapor VIII crew, optimally for any weather conditions, they have equipped the upper with, the already very popular, ACC technology (All Conditions Control); which provides the same grip in wet, as well as, dry conditions. Inevitably, the choice of upper will have an effect on the weight and it can be hard to single out a specific favourite. The Nike Mercurial Vapor VIII ACC CR7 weighs in at 185g, and is hereby 25% lighter when compared to its predecessor, the Superfly III. Anyhow, the Adidas F50 Adizero manages to beat this with a weight of just 165g for the microfibre version. Hereby, it breaks the scale, and comes in as the lightest mass produced football boot on the market currently  we take our hats off! On the contrary, the Adidas F50 Adizero leather model has actually put on a bit of weight, compared to the previous generation. It now weighs in at 203g, but we should still keep in mind that this is exceptionally light, considering it's a leather boot. Adidas manages to combine low weight, with both comfort and touch from leather, something Nike can not match. Or can they? Is the Teijin upper just as good? 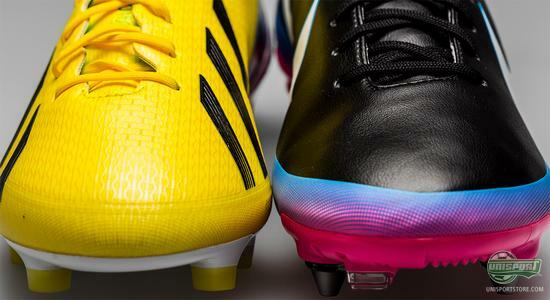 One of the Adidas F50 Adizero's absolute trademarks is the super light Sprintframe outsole. A ground breaking sole, and a key attribute in connection with the exceptionally low weight. In addition, the boot is equipped with torsion bars that ensure stability when needed. The Nike Mercurial Vapor VIII ACC CR7, on the other hand, is equipped with a fibreglass outsole. Two layers or fibreglass ensure that you will benefit optimally from the effort you put in, and you will hereby make optimal use of your speed. 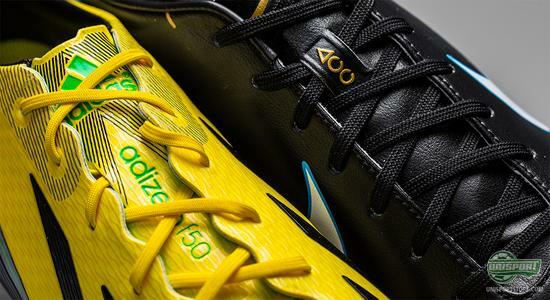 Adidas F50 Adizero is on it's fourth generation, but continues with the same stud-system, Traxion 2.0 that has only been given marginal updates. It's the triangular studs, that maximise the grip in the pitch when you accelerate, run sideways or decelerate. It works fantastically well and is definitely part of the reason, they haven't opted to change it; If it ain't broke', don't fix it. At the same time Adidas were the first among the two brands to introduce a mixed stud-configuration. 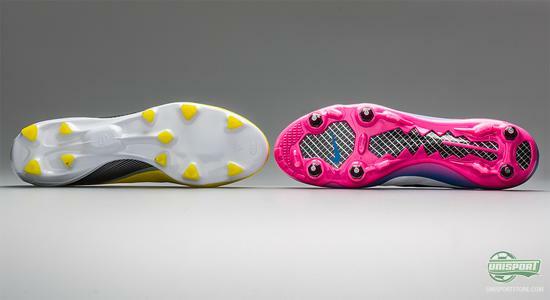 It was the combination of FG- and SG-studs, that gave phenomenal grip without compromising on the stability or comfort. On the Nike Mercurial Vapor VIII ACC CR7 they have added the new stud-configuration, where they have gone away from Nike sense-studs, that we know from the Superfly II and III. 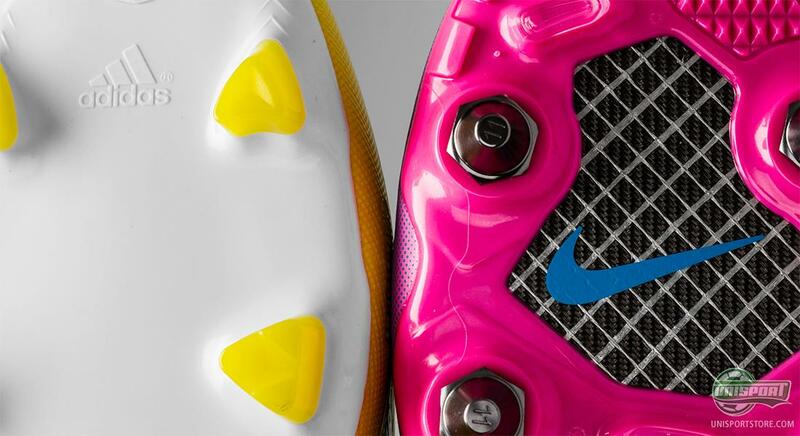 They have instead revolutionised and also slightly shocked the world with two new stud-systems; FG and SG Pro. The first mentioned is based on its ability to quickly enter the ground and just as quickly leave it again, this results in the well known explosive speed. Furthermore, they have also introduced the SG pro stud-configuration, which is a mixture of FG and SG studs, so you get maximal grip and stability in wet conditions. 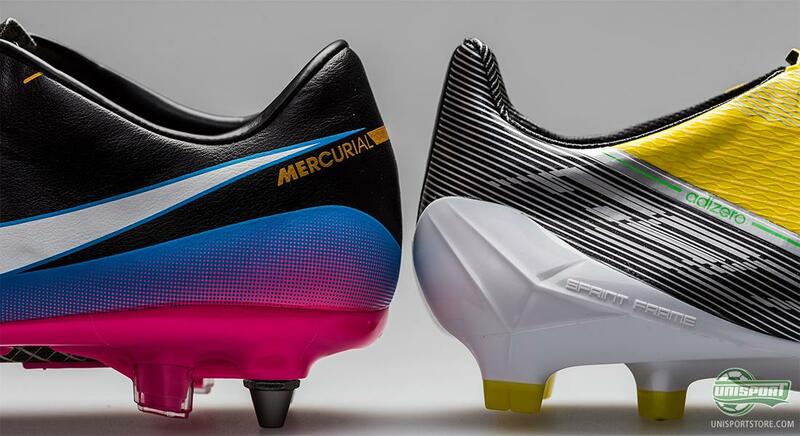 Yet another area where the two boots compete is the design. 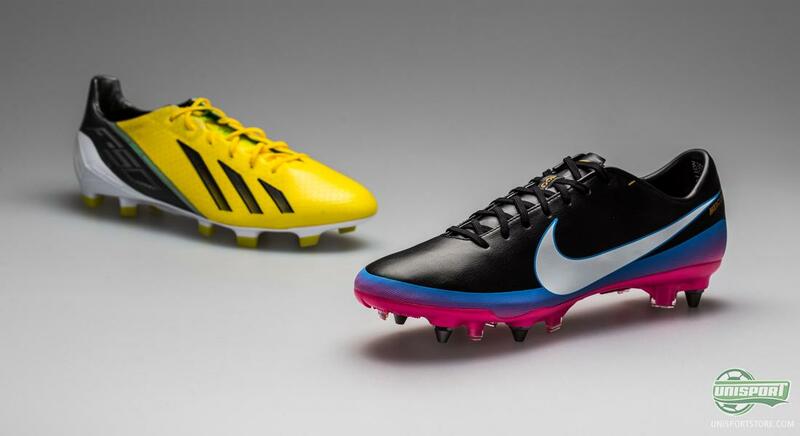 Each boot will most likely have it's own set of fans, but from time to time, either Nike or Adidas are able to sway boot fans with their delicious designs. 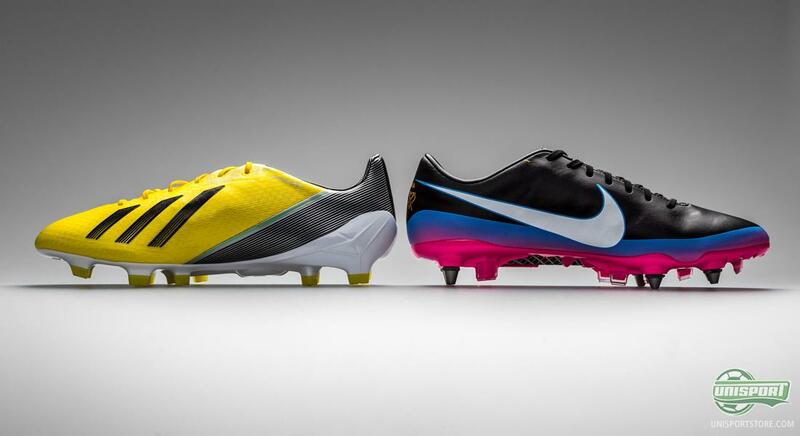 On the newest model Nike have gone for a primarily black design, that is like a crack of thunder, broken up by the big, white Nike-swoosh on both the boots lateral- and medial-side. 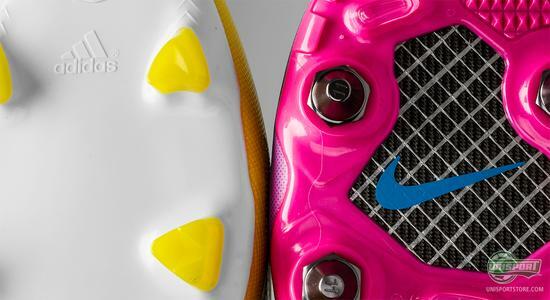 As if that wasn't enough, there's also the accent colours at the bottom of the boot, where a fresh blue colour fades into an ,in your face-type, pink. It gives the boot a very sophisticated and elegant, yet cheeky look. The designers behind the Adidas F50 Adizero have chosen to go a different way. It screams out speed, which is far from a bad attribute, when you consider, that it's exactly speed, that's the boots force. You instantly feel fast, when you put on a pair of Adizero. The yellow and black colour-variations will get you noticed on the pitch and especially your direct opponent, will be left behind in awe. Cristiano Ronaldo is synonymous with the Nike Mercurial Vapor VIII ACC CR7 in the same way that Lionel Messi is with the Adidas F50 Adizero. Each capturing the playing style, personality and ambition level of the, widely accepted, two best footballers in the world. They both want to be the worlds greatest, but in the end only one player can have that honour. But who? Who's the worlds best footballer? 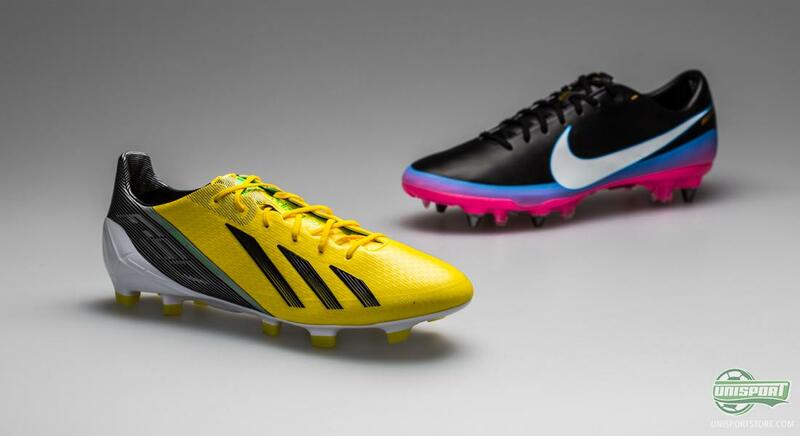 Who plays in the worlds best speed-boot? It can be hard to choose your favourite and even harder to decide on which is best. Is it Cristiano Ronaldo or Messi? 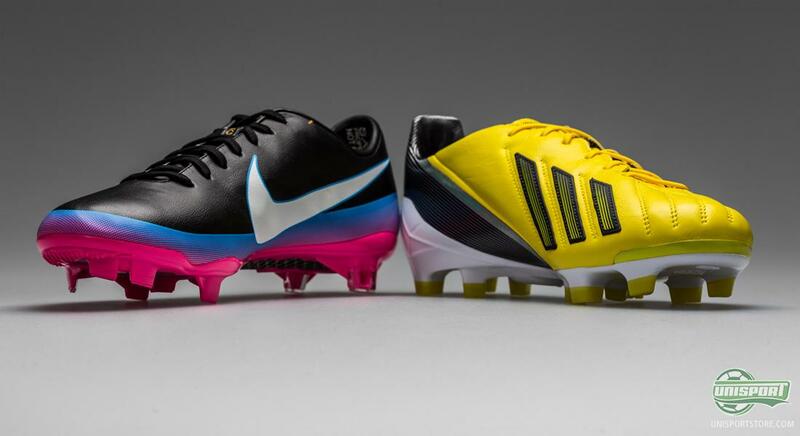 Is it Adidas F50 Adizero or Nike Mercurial Vapor VIII ACC CR7? Tell us what you think in the comment-section down below.